Image of a recycling bin from the Coca-Cola Company/Keep America Beautiful Award. Keep America Beautiful and The Coca-Cola Company have awarded 50 new recycling bins to Illinois State University. Keep America Beautiful and The Coca-Cola Company are working together to address one of the primary barriers to recycling in public spaces by making access to recycling bins more readily available and convenient through the 2016 Coca-Cola/Keep America Beautiful Public Space Recycling Bin Grant Program. Illinois State will place the bins in various public spaces including the Tri Towers residence halls, Redbird Arena, and Hancock Stadium. The bins will also be used during home football games for the collection of recycling from tailgating activities in and around Hancock Stadium. The bins will make recycling more convenient and more uniform as they will be the only style used, which will help avoid any confusion caused by having multiple styles of containers. In total, the Coca-Cola/Keep America Beautiful Public Space Recycling Bin Grant Program will provide 3,522 recycling bins to colleges and universities, along with 996 bins to local governments and nonprofit organizations. 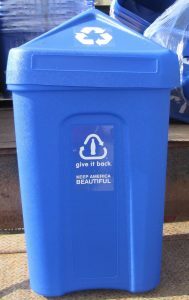 The recycling bins are made possible through a grant from Keep America Beautiful and The Coca-Cola Foundation, the philanthropic arm of The Coca-Cola Company. Grant recipients were chosen by Keep America Beautiful based on their potential to collect the most cans and bottles as well other considerations such as the extent of their need, recycling experience, and their ability to sustain the program in the future. A full list of the 2016 Coca-Cola/Keep America Beautiful Public Space Recycling Bin Grant recipients, as well as Keep America Beautiful’s best practices guide, “Designing Effective Public Space Recycling Programs,” are available here.